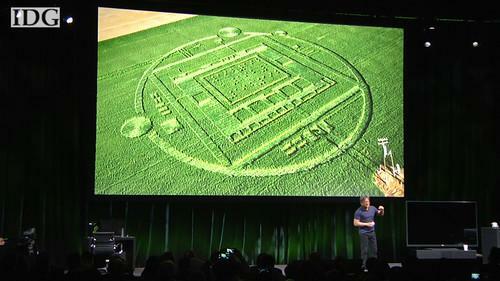 An elaborate crop circle that appeared last week in a grain field in California was a stunt by chip-maker Nvidia. "This is a confession," said Jen Hsun Huang, CEO of Nvidia during a news conference in Las Vegas on Sunday, before he explained how his company came to create the circle in a field of barley near the town of Salinas. It was linked, he said, to his company's latest processor for mobile devices, the Tegra K1. Huang had minutes earlier introduced the chip, which packs 192 cores -- individual processing engines that handle complex mathematical calculations needed for 3-D modeling, simulations and computer gaming. "I told the [engineers] that Tegra K1 is impossibly advanced, it's practically built by aliens," he said. "I want you guys to go out and launch this product, to put a marketing campaign behind it that rivals the technical contributions. I want you guys to go and do something that when we sit back will have global reach ... and you have zero budget." The crop circle was the result of that challenge. Huang said he first heard about the stunt when he saw coverage on CNN. It garnered global attention and Huang gave special recognition to Michelle Imperato, a reporter with local TV station KSBW that cracked a hidden code inside the design: the number 192 spelled out in Braille. "Well, of course it's 192 because the marketing team was very clever, ha ha. Tegra K1, 192 cores," he said. Crop circles have been appearing in fields for decades. Their origin is usually a mystery and while many assume them to be man-made, some believe they might represent calling cards by by extra-terrestrial visitors.